I noticed several times now, that syncthing uses high CPU without doing anything apparent. By coincidence i just noticed that this time the high CPU usage started when another client started up and connected. Maybe they were syncing file lists or something like that. Yet the data transfer was pretty low. After several minutes the CPU usage went down again. I have installed now Debugging Tools for Windows and next time i see it i will make some stackdumps of the active threads. This should be useful to determine what is happening there. Until then: Any ideas what is causing this? 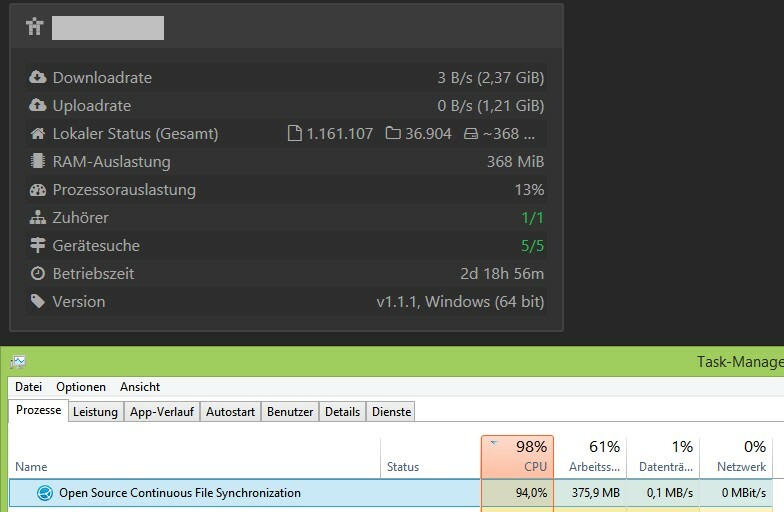 Instead of debug view you could also create a cpu profile via https://docs.syncthing.net/users/profiling.html, would even contain more information. There’s a bit of housekeeping going on when a device connects: Exchanging config messages, potentially exchanging indexes (both wont show up as high data transfer) and after that, a sync operation is scheduled. Unless there is anything to sync (which it doesn’t look it is), that should all be fairly cheap. Another option is, that it’s web UI related: On connect it might do REST queries to the DB. You could test that by not having the UI open when a device connects. Here are some stackdumps while the CPU is high. I’ll try the COU profiler, too. I can’t edit my last post (there was a typo “COU” -> “CPU”). Even if i remove 90% of my post. Please can you fix this?! How can i analyze these pprof files myself? I just want to take a look inside. What tool(s) can I use? Forum software is buggy. I’ve done an upgrade now, finally - it may help, maybe.